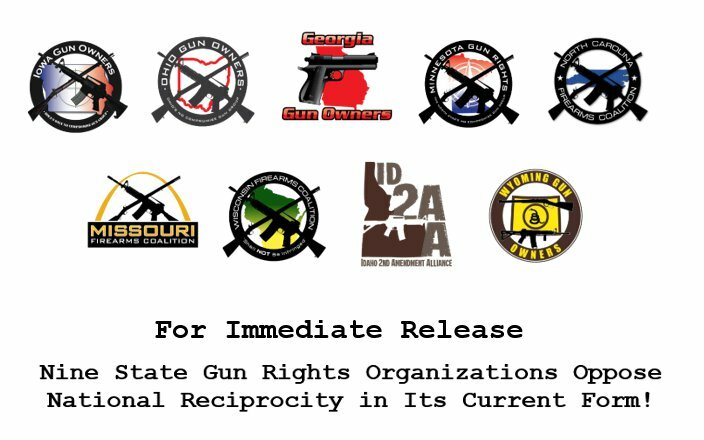 Nine State Gun Rights Organizations Oppose National Reciprocity in Its Current Form! On election night in 2016, gun owners saw their dreams come true as Hillary Clinton was defeated and President Trump was elected, thanks in no small measure to the tireless efforts of grassroots gun owners. After eight years of fighting with President Obama’s Administration to defend our gun rights, many gun owners assumed that 2017-2020 would be our chance to go on the offense in Washington D.C.
And that is why the membership and leadership of the undersigned organizations are outraged about the recent merger of National Reciprocity legislation with Senator Diane Feinstein’s ‘Fix-NICS’ gun control legislation! In it’s current form, we absolutely oppose HR 38. More, we are calling upon our membership to contact their Senators and demand they oppose any gun bill that contains language being pushed by Senators’ Feinstein, Murphy, Schumer and others to ‘Fix-NICS,’ which is nothing more than a massive federal gun registry in the making. NICS didn’t stop mass shooters in Orlando, FL., Ft. Hood, TX., Las Vegas, NV., Charleston, SC., and many others and expanding NICS will be no more successful. But Senator Feinstein isn’t worried about that. She’s simply using the recent tragedies in Las Vegas and Texas to attempt to create the largest federal gun database this country has ever seen. But she could never accomplish this on her own. Spineless Congressional leaders like Speaker Paul Ryan, House Judiciary Chairman Bob Goodlatte, Senate Judiciary Chairman Charles Grassley and others have assisted Senator Feinstein in working to pass this gun control bill, a bill she couldn’t even pass under the Obama Administration. The same goes for the National Rifle Association who have been working behind the scenes to orchestrate this entire thing. At a time when gun owners needed them most, and trusted them to fight to expand our gun rights and stop Senator Feinstein and her allies, the National Rifle Association choked yet again. Sadly, grassroots gun owners aren’t even surprised anymore after the National Rifle Association also called for a ban on ‘bump stocks’ via ATF administrative rules, in another feckless action trying to placate the D.C. Swamp. Besides helping to enact bad policy, the National Rifle Association’s actions are just bad politics, as many anti-gun Democratic and weak-kneed Republican congressman can and will use this vote for political cover for years to come. To reiterate, the undersigned organizations consider a “Yes” vote on HR38 as a vote in support of gun-control and will relay that to our members. Thanks to state level gun rights organizations and social media, grassroots gun owners have never been more able to ‘look behind the curtain’ and see exactly how their gun rights are being betrayed by weak Republicans and the National Rifle Association. To those gun owners who are angry about this betrayal, contact your Senators immediately, as this fight now moves to the Senate. Then join a state and federal gun rights organization that won’t betray you. If the gun rights organization in your state is hanging their head in guilty silence, and is too afraid to call this bill out for what it is, start a group of your own. We Need Your Help Next Year! I have said this many times this year, that the NRA was never a conceal carry true supporter. I and many gun owners in Wisconsin will vote against the GOP in 18/20 as a pay back if they pass HR 38 with Feinstein’s bill. End of story. I have already dropped my NRA membership because of what they did on bumpstocks. Anthony Jorgensen. WI gun owner.